Turtles are always considered to be an interesting animal to the human kind, due to their peculiar behavioral pattern of withdrawing into the shell, whenever they feel threatened. Many species of turtles are endangered by humans now and snapping turtle can be said to be one of them. 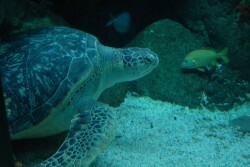 It is a species of the turtle family found mainly in North America and is widely hunted for their meat in this region. Zoological details of snapping turtles: Common snapping turtle and alligator snapping turtle are the two kinds of the common snapping turtles. . Chelydra serpentina is the zoological name of common snapping turtle under the genus Chelydra; while alligator snapping turtle has the scientific name Macrochelys temminckii, categorized under the genus Macrochelys; both belonging to Chelydridae family of animal kingdom. Physically both turtles look greatly alike, except for their difference in size; thus it is proved by zoologists that they belong to separate genii within the same animal family, where most of the other species are already extinct. Natural habitat area of snapping turtles: They are found only in shallow freshwater; like lakes, streams, ponds or even in estuaries of North America; from southeastern part of Canada to as far as Mexico. Common snapping turtles– These turtles are found in the stretch from the southwestern part of Rocky Mountains to the eastern coast of Florida and Nova Scotia, till northeast Mexico. As it is very widely seen in almost all water bodies in this vast area, thus you get the word common in their name. Ways to capture snapping turtles alive: Sometimes people may want to have a pet turtle, as they are quite amusing to watch and seem to be friendly towards human in water. But capturing common snapping turtles is really too difficult without mortally hurting them; as they can bite if caught even at the back, due to their extremely flexible neck. If caught by the tail only, it is highly possible to break their vertebral column and cause even death. One can easily capture the Alligator snapping turtles as the smaller ones can be caught easily by their tails and fully grown-up ones are to be caught by seizing their hard shell on both sides. Mostly they are bred in confinement, still not preferred as a pet by all due to the difficulties of handling, mainly because of their large size. Descriptions of the snapping turtles: All snapping turtles can be said to be larger in size than other ordinary turtles, so they cannot retreat fully into their shell to protect themselves. But they are gifted with the ability to snap at the attacker, hence their name. Common snapping turtles have a rocky- looking shell, with number of ridges which are more prominently seen in the younger ones. The alligator snapping turtleâ€™s body is much heavier than other snapping turtles, and its shell is much thicker too, marked with three prominent ridges on it. 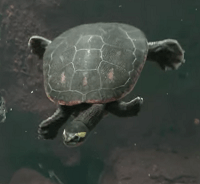 The head of the turtle is too flexible, thus they can move and stretch it towards any direction and up to a considerable length, much similar to a snake head. Thus it is named serpentina as its species name; as in Latin serpentine means snake. Common snapping turtle usually weighs around 16 Kg, while the shell measures to be 25 â€“ 50 cm in length. But the alligator snapping turtle weighs as much as over 100 Kg, with the shell measuring till a great size of till 80 cm. Both the snapping turtles have very sharp and strong jaws, along with beak-like mouth that is useful in catching the prey; also they have quite sharp claws for their protection. Normal diet of the snapping turtles: They are mainly carnivorous, eating only fish and other small aquatic animals in water. They also feed on dead meat or fish, due to the lack of fresh prey. 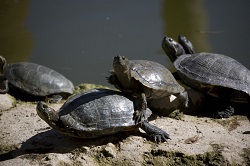 They eat water snakes, water birds or even aquatic plants; sometimes they are seen to feed on other smaller turtles. Sometimes they come up to land near water bodies, to prey upon small animals like squirrels, opossums and raccoon's. Other interesting facts about snapping turtles: Like many other creatures of nature, we can find some fascinating snapping turtle facts too. The snapping turtles mate once a year, between AprilbNovember; then the female travels far away from water and lay eggs after digging a hole in a suitable spot, then cover the eggs with sand or mud for proper incubation. All snapping turtles behave very friendly while in water, but become furious if taken out of water. These turtles have a protrusion at the end of their tongue that much look like a worm, they held out their tongue so that any fish can mistake it as a worm and get captured by the turtle if the fish comes too near it. Get the Snapping turtle Pet guide Here! What Next? Well...Check out the links below!